I am resubmitting this card as I decided to make it into an aperture card which makes it more interesting. I got the idea of using cello bags for windows from somewhere so had a go. I am not very good at measuring but managed to cover up any mistakes by using the blue patterned self adhesive tape. I got it on sale and it has got me out of a few STICKY situations. 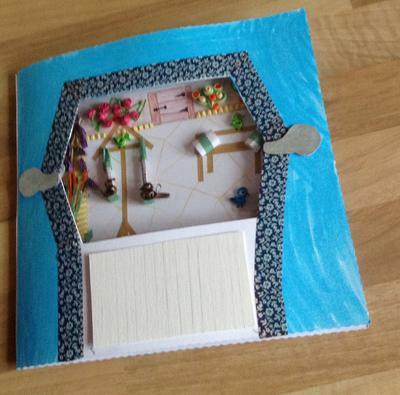 In my last submission I had just taken my first batch of cards into my local Hospice Charity Shop. They have sold about half of them so it's looking quite hopefull. The assistant said often people go in and say they can't find exactly what they want so she took my details for future reference. 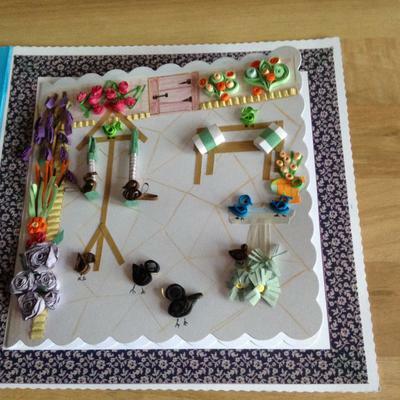 How novel is this card and clever of you to put it together to look just like a garden. It is lovely and I love the birds around the birdhouse. The whole card tells a story and you will quite rightly be proud of it. And how kind of the assistant to take down your details as making cards that people commission is very rewarding and I don't mean that in a monetary sense. I like scalloped cards but bought some plain 8 inch square ones by mistake. There seemed to be so much white space to fill. I have been watching The Big Painting Challenge on a Sunday evening, one of the artists colours her canvass first because she doesn't like the white space facing her, I know how she feels. Anyway, I had messed up some Easter cards for the Charity Shop by trying to write the sentiment and it looked awful so I salvaged what I could, painted the background and matted it onto the front of the new card. 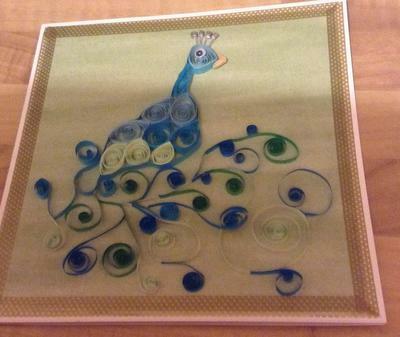 I am a great fan of decorative self adhesive tape and quilling as you can see. When the card was opened there was the problem of WHITE SPACE again so, I bordered the page which bears the sentiment with matching tape and that I think solves the problem. Oh yes I also bought a Happy Easter stamp and some stencils so that's a step in the right direction. Filling the white space can also be achieved by embossing the card, using some of the beautiful spritzing effects that can be done or adding inks too. It is always playtime when you get crafting as there are so many things that you can try once you get started. 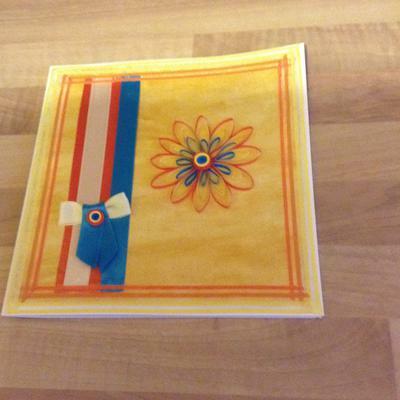 I felt very springlike today so decided to make a card to celebrate. 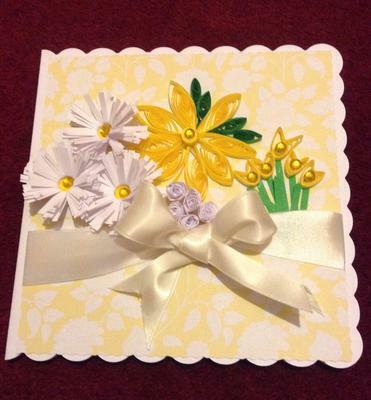 I enjoy quilling flowers and I know quilled cards are popular as they are the first to go at the charity shop. I'd bought a paperstack which had this lovely lemon and White paper in it which helped to inspire me. 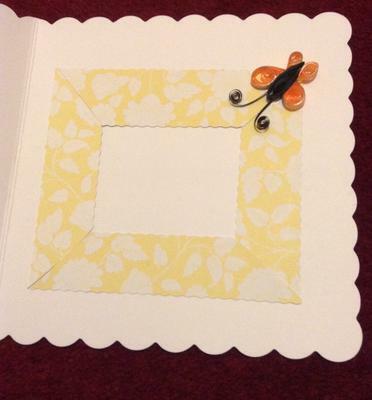 The first thing I did was place a frame of the backing paper on the inside of the card (pictured) I like to put some interest on the inside of my cards and have learn't from experience to do this first. I then placed the lovely cream ribbon on the topper and matted it onto my favourite 6 inch scalloped card and spent a lovely afternoon quilling flowers. The bow went on next so I could nestle the rosebuds into it, I find rosebuds need to nestle as they aren't flat bottomed like daisies. I finished by adding some yellow rhinestones an popped a butterfly inside as a surprise. 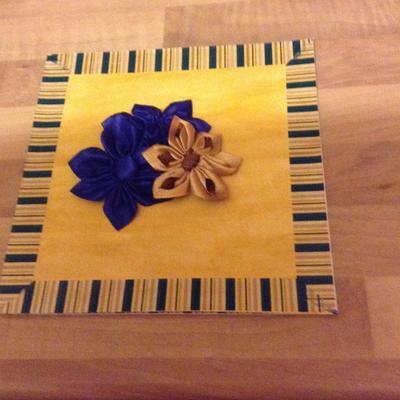 I have made a conscious effort to use more yellow in my cards just lately and it really is growing on me as I do.